Although construction is underway on our new Pet Adoption Center, we are still open and adopting animals and providing services as usual! You may notice lots of cars parked on Dickey Road outside the shelter, but don’t worry: we have staff and volunteers parking there so that there is plenty of room for customers in our parking lot. 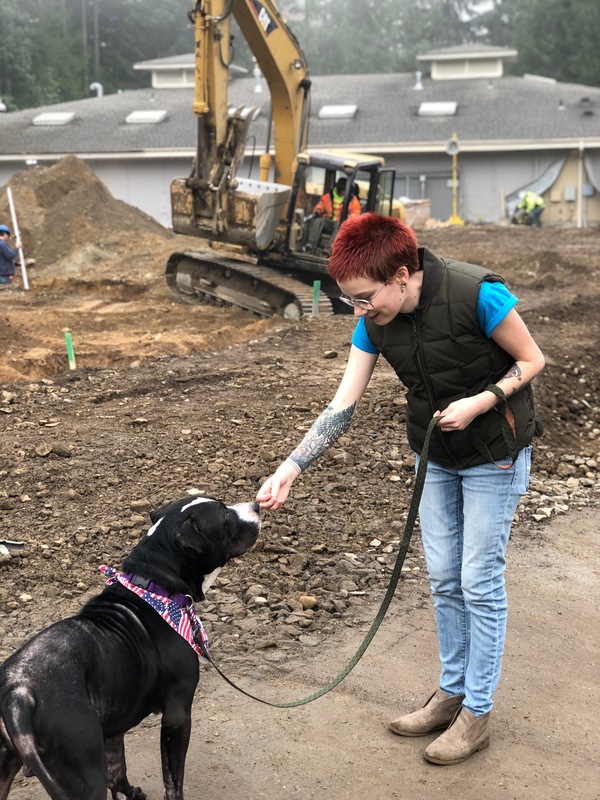 Construction crews and bulldozers have been moving massive piles of dirt around for weeks as they prepare to pour the foundation for the new Pet Adoption Center, which opens next summer. 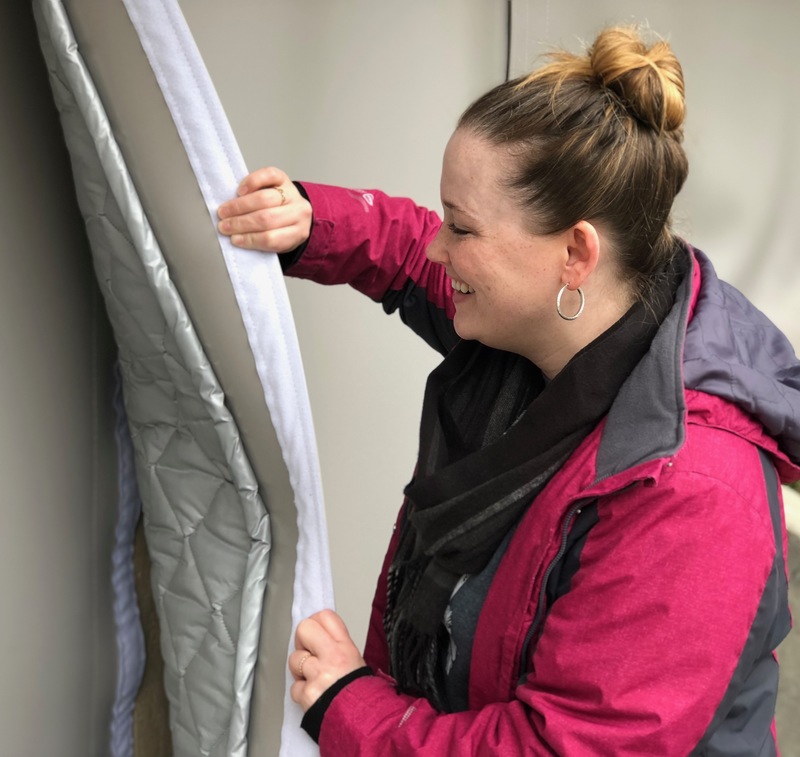 Heavy sound-proofing blankets, shown by Sarah Moody-Cook on the right, resemble x-ray blankets and have been hung on the walls of the existing shelter,significantlyreducing the noise inside the dog kennels. Thanks to our generous foster volunteers, more dogs are spending time in foster homes during the construction – a 50 percent increase in dog foster placements over last year. Volunteers are taking dogs on sleepovers and shelter breaks, lasting one to three days. This gives dogs a chance to relax and sleep well in a home setting. Volunteers are also taking dogs on one- to two-hour outings that include car rides and trips to the park, beach and mountains for hikes and playtime. Dogs are getting time out of the kennels in our special “relaxation room” with toys, treats and visitors. Inside the shelter, dogs are treated to “scent work” and food puzzles, lavender spray, Adaptil collars that contain calming pheromones, classical music, white noise machines, Thundershirts (heavy jackets that have a calming effect on stressed animals) and lots of blankets for their beds. “We’re seeing a decrease in stress-related behaviors such as panting, drooling, and excessive barking because of these strategies,” Moody-Cook said. While our cat population is not heavily affected by the construction, we’ve still been proactive about reducing potential stressors, and have implemented a schedule for spraying Feliway (a cat-specific calming spray) in the cat kennels each day. If you want to help the animals during this exciting time in the life of our shelter, please consider becoming a foster parent, a dog walker, or joining our offsite outing team. With your help, we’re building a more humane community for us all.